The days are short now. I’m feeling a bit better, but not yet ready to be out and about, so we’re settling into a quiet routine, enjoying our Christmas decorations and the snugness of our home. We’ve been collecting ornaments since the beginning of our relationship, and now have a collection of memories to hang on our tree. Many are handmade, some of them came to us as gifts, and others we’ve bought on our travels to remind of us of special people and places. 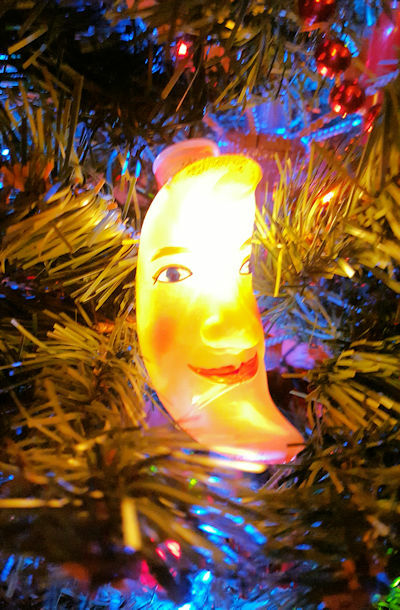 This illuminated moon came to us from California in 2010 when I took Jeff to see the Petaluma marvel that is Marisa’s Christmas Fantasia.